Nite Owlz All Night Blog Spot: Fixx-ing What's 99% Broke: The Fixx, Inspired by OWS, Return With New CD "Beautiful Friction." The Fixx have always been the thinking man's (and woman's) new wave band. Of course, we like to think so because we like them and we like to think of ourselves as smart. (Duh!) Even beyond our obvious bias, however, the "thinking man" label has stuck for one simple reason: It's true. And, not only have The Fixx consistently made us stroke our chins and go "HMMMM" many times over the years, but they're also a fierce live act and one of the most innovative and undervalued forces to emerge from the new wave scene of the 1980s. Now, the band that gave us such classics as "One Thing Leads to Another," "Saved by Zero," "Red Skies," "Are We Ourselves?" and "Secret Separation" are back with a vengeance on a brand new studio album called "Beautiful Friction." The album, inspired in part by the energy of the Occupy Wall Street Movement, draws upon the tensions and anxieties that define our modern age and, hopefully, presage a better tomorrow. There's no bandwagon jumping here; anyone who knows the Fixx's history will recall that these themes have cropped up in their music repeatedly over the years. (Even back in 1986 they were singing, "The rush of youth, what it could achieve.") The social and political events of the last few years have merely re-energized the band and sharpened the focus of their creative laser beams. It's also worth noting that "Beautiful Friction" features ALL the members of the best-known Fixx lineup, right down to the funkiest guy to barely ever move on stage (and the man behind some of the most memorable grooves of the 80s), bass player Dan K. Brown. Jamie West-Oram - one of rock's most insanely underrated guitarists - is on board to provide his patented, jagged riffing and those clean, chiming guitar tones that ring out like the harmony of the spheres, while Adam Woods is on hand to swiftly and safely bring those chords back to earth with his pounding drums. Rounding it all out is Rupert Greenall, who loves to soak everything in a scary, sinister vibe - that is, when he's not using rushing keyboard lines or bell sounds to create moments of sheer, other-worldly beauty. And if any of this sounds like it borders on the portentous, fear not: The Fixx are way too crafty with a hook and way too savvy with their pop-smarts to let the album ever get bogged down with the weight of its own ideas. These guys are no strangers to the Billboard Top 40, after all! "Beautiful Friction" is a timely latter-day release from an important band who still care about making lasting music in a world that gets ever more disposable by the second. These are crazy times we live in; it's good to know The Fixx are "still around" to help us through it all - and keep us thinking. 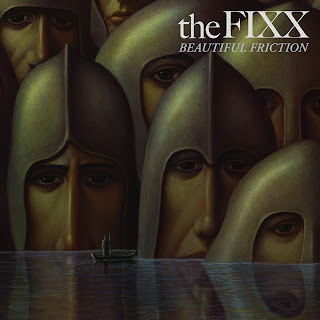 Buy "Beautiful Friction" by The Fixx at Amazon.com!